Sunday morning sees the second race in the Formula 1 2014 championship, and the venue is the steamy, downpour-prone Sepang Circuit just outside Kuala Lumpur in Malaysia. 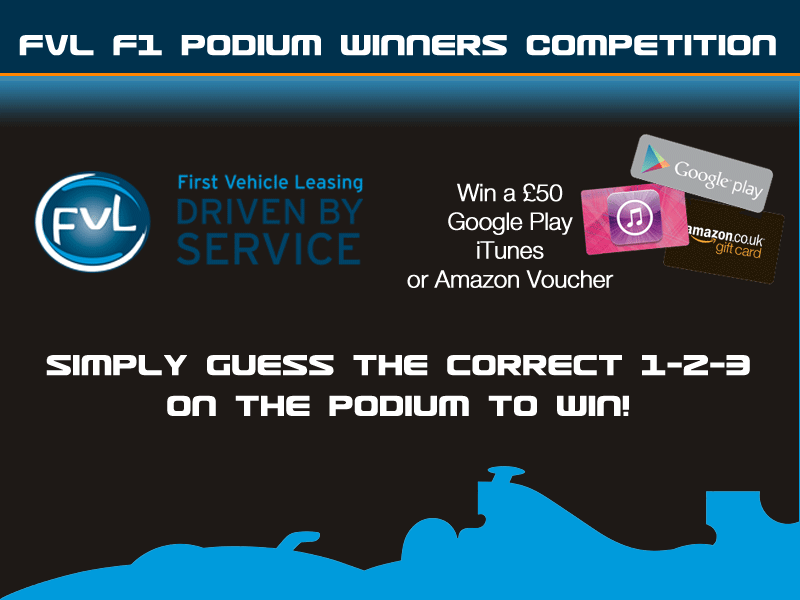 As with every other race this year, you can enter our FVL F1 Podium Winners Competition with your podium predictions for the Malaysian Grand Prix to win £50 of vouchers of your choice. You must be UK resident and 18+ to enter. Full FVL F1 Podium Winners Competition Rules are here. Just click here to go to entry information. This saw many drivers finding their feet on a very green track, with many taking excursions off-track and spinning off. Victims included Fernando Alonso and Lewis Hamilton. Hamilton was using the same engine as that which caused his retirement in Australia, with Mercedes engineers happy that they had solved the problem that caused it to only fire on five cylinders. 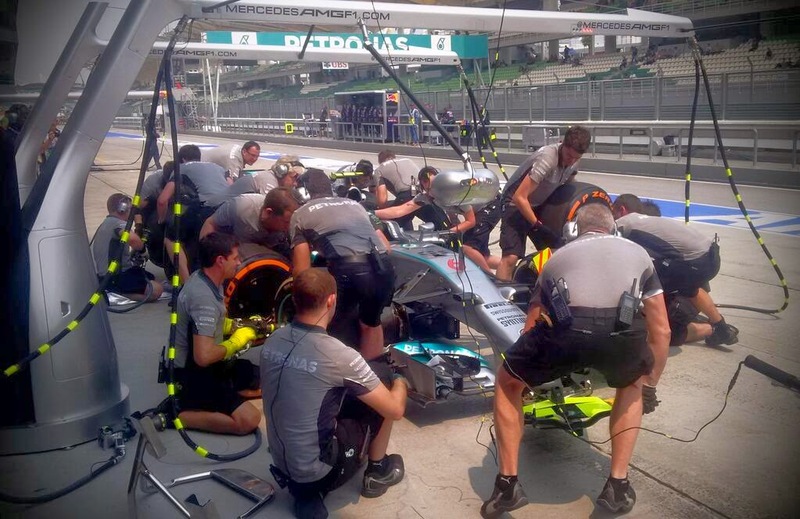 The engine is likely to be changed for Qualifying to a new unit, but this told them that the fault had been rectified and the power unit was sound. Both McLarens showed good pace, with all cars using the hard compound tyre for this stage of practice, showing fair pace in 4th and 5th for Button and Magnussen respectively. The woes continued for Lotus, with Romain Grosjean’s car stopping on the track on his installation lap, and a run at the end saw of the session saw him come straight back in to the pits and not re-emerge. Team-mate Pastor Maldonado hardly fared better – late in the session, he stopped at the pit entry after being told to switch off his Renault engine which was smoking heavily. In the second session, with the track now better rubbered in, Nico Rosberg led a tightly contested field with the Ferraris of Kimi Raikonnen and Fernando Alonso showing good pace. Red Bull’s Vettel was close to the front pace, and Felipe Massa’s Williams also started to show its potential. It was clear that Mercedes, Red Bull and Ferrari were showing the best pace of the field, although the first 11 cars were all within a second of each other, signalling that Qualifying and the Race might be hotly contested. This session saw teams begin running on the softer medium compound tyres, which caused a lot of understeer problems initially as the grip on the track improved. Poor old Lotus had a miserable time again, with Maldonado not getting out of the garage at all, and Grosjean managing a slow 1m 42.531s before yeat again pulling off with mechanical problems. At Caterham, Ericsson fared better than his luckless team-mate Kobayashi, who spent the session in the garage watching proceedings. 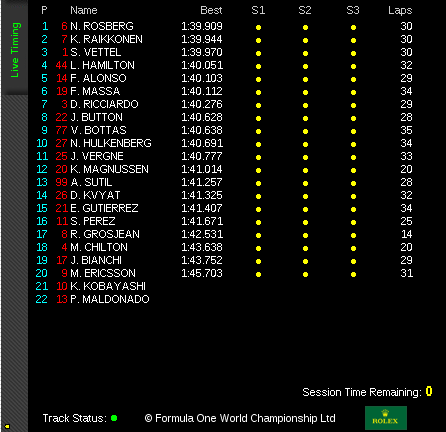 Late in the session, as many teams did longer runs, both Ferrari and Red Bull seemed to suffer from tyre degradation. Mercedes were giving some interesting instructions to their drivers, with Rosberg being asked to brake later and carry out some ‘lift and coast’ methods of getting around the circuit, while Hamilton was asked to pull back on the pace to keep fuel consumption to plan. We’ll be updating this blog with the results of Qualifying tomorrow, and look forward to seeing your FVL F1 Podium Winners Competition entries! Rain. 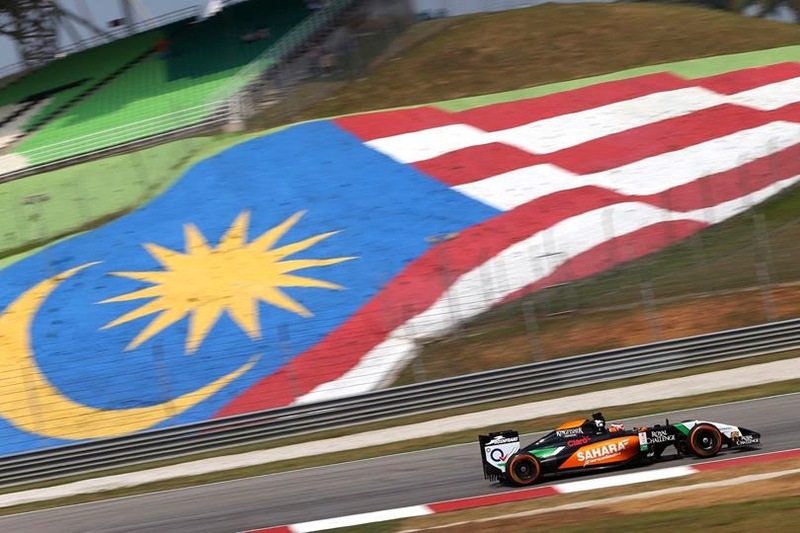 The torrential Malaysian rain put back the start of qualifying for first 15, then 30, 45 and finally 50 minutes, and of course the track was washed clean of rubber laid down in practice sessions. First runs were mainly on intermediate wet tyres in Q1, with McLaren opting for full wets, expecting rain during the first part of qualifying, but swapping to intermediates as a dry line formed quickly on the track. And then the rain hit again. And then a red flag after Marcus Ericsson lost control of his Caterham hitting a kerb, then being swiped round into a barrier, losing his right front suspension, and spinning to a halt on track after taking out a marker board, providing a very near miss for Gutierrez in the following Sauber. Despite the dramas, no early surprise exits from Q1, other than Adrian Sutil in the Force India, which he’d been having problems with since Friday. Q2 started with more rain, prompting most teams to put out full wet tyres. Kimi Raikkonen took a punt by going out on intermediates, and than changing back. Meanwhile Alonso was hit by a wayward Daniil Kvyat under braking into a corner, with the Toro Rosso clumsily sliding up the inside of the corner, snapping the top wishbone on the Ferrari’s left front suspension. However, with a red flag being imposed on the session with 12:46 of Q2 remaining, Ferrari were feverishly working to repair the damage, and got Alsonso back on track with 10:40 remaining to run in steady rain, and made it into Q3. Williams had a mystifying choice of intermediate tyres to start Q2 for Bottas, and seemed oblivious to their relatively poor performance until it was too late, then bizarrely swapped Massa onto intermediates and Bottas onto full wets towards the end of the session. Both failed to make Q3. Q3 started with easing rain, with McLaren choosing to start on, and continue on intermediates, hoping for a drying track that never appeared. Hamilton put it on pole again, but Vettel was very close behind, just getting his timing wrong to slot in an extra fast lap, and just ahead of the second Mercedes of Rosberg. Alonso managed P4, with Ricciardo’s Reb Bull in 5th ahead of Raikkonen. The weather will be the decisive factor tomorrow for the race, with current predictions running 50/50 wet to dry. No winners this week – but a close thing for Andrew Watson – got the top three, but just not in the right order. 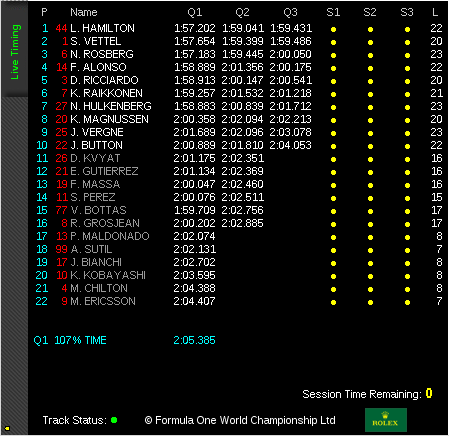 Race result: 1: Hamilton 2: Rosberg 3: Vettel. Remember the Bahrain Grand Prix is coming this weekend!